A perfectly ripe pear is a joy unto itself, requiring little more than a bit of cheese and a handful of nuts to make a memorable dessert. Sadly, I haven’t encountered many perfect pears. The pears of my experience tend to be hard as rocks at the market, only to bruise and scar in the bag on the trip home, then turn to mush almost overnight on the kitchen counter. Sometime in between, I know there is a point when they’re just right, the flesh still slightly firm, the sweet juices flowing freely. But I miss it more often than not. Still, I can’t resist the promise of pears. Every fall, I find myself buying gorgeous pears at the peak of the season in the hope I can catch a few at the elusive moment of perfection. It’s a good thing I have this cake as Plan B for the fruit that doesn’t measure up. It’s especially good with Bosc pears. 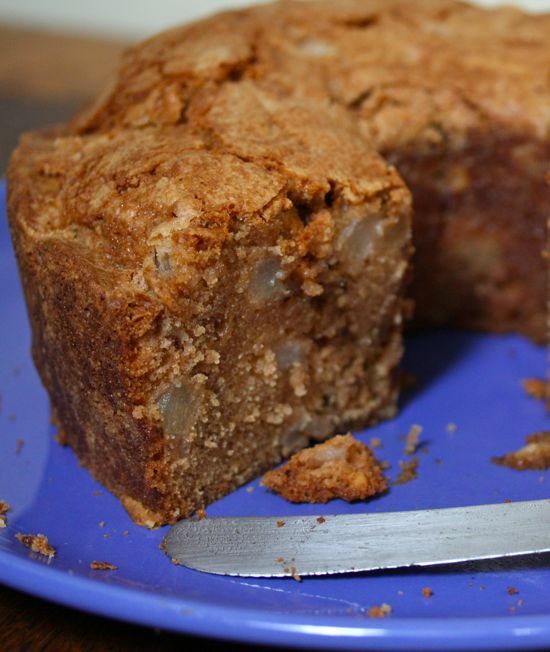 Moist and spicy with the subtle flavor of pear and the crunch of walnuts, this is just the cake I want for holiday brunches and buffets. Although it has plenty of sugar and fat, it feels like a healthful option compared to most holiday sweets. The recipe is inspired by a fresh apple cake I found while browsing through a three-decade-old James Beard cookbook, “The New James Beard” (Knopf, 1981). I’ve updated it by reducing the oil, shifting the balance of spices, introducing whole wheat pastry flour and eliminating the final glaze. The result is a cake with a dense crumb and a wonderfully crisp and crusty top. In keeping with its rustic character, this is a fairly simple cake to put together. Since there’s no butter to cream, it easily could be stirred together by hand, although I rely on an electric mixer. The flour, baking soda and spices are whisked together instead of sifted. I assemble all the ingredients before peeling and chopping the pears since the flesh turns brown so quickly once it’s exposed to the air. The basic recipe is pretty adaptable. You could substitute apples, persimmons or frozen blueberries for the pears. Any neutral vegetable oil will do, too, although I prefer the flavor of sunflower oil. The next time life hands you imperfect pears, remember, there’s always a cake to bake. Preheat oven to 325 degrees. Butter and flour a 9- or 10-inch tube pan. In a large bowl, combine oil and sugar and mix until well blended. Add eggs one at a time, beating well after each addition. In a medium bowl, whisk together flour, baking soda, cinnamon, nutmeg and salt until thoroughly mixed. Add about a third of the flour mixture at a time to the batter in the large bowl, mixing well after each addition. Stir in the diced pear, walnuts and vanilla until mixed well. Pour batter into prepared tube pan and bake for 1¼ hours, or until a toothpick or skewer inserted into the cake comes out clean. Let cake stand on a wire rack until completely cooled. Run a thin knife around the edges of the pan and turn cake onto a platter before serving. Just goes to prove the adage about great minds, Carolyn. But it sounds like you beat me to this cake. I try to pick up old James Beard cookbooks whenever I see them. His work has always been great inspiration for me. Thank you, Aleta! Last Saturday, I scored some lovely Sri Lankan cinammon from the Spicehound lady at the PA Farmers Market, so I\’m all ready to go. Do you think I could get away with half a cup less sugar? I\’m not Harold McGee, therefore don\’t know science of what that might do – but I bet you do! You can try it, Sara, but the texture will change as well as the color. Sugar makes baked goods more tender and promotes browning. I’m no expert at reducing sugar, though, and generally avoid low-sugar baked goods. I’d rather just eat less. If you’re intent on reducing the sugar, you might try cutting it by 1/4 cup increments first and see how it works. If you like it, go for the 1/2 cup cut. Aleta, this is mouthwatering! Do you think it would work with the awesome apple pears they are selling at Trader Joe’s right now? Have you tried those? I’m addicted to them right now … they aren’t very pretty but they nail that pear taste every SINGLE time. Amy, I’m glad it appeals to you. If TJ’s fruit tastes like pears and has a good texture, it ought to work fine. After all, the original recipe was for apples. …Are you sure it isn’t Asian pear, which looks a lot more like an apple than a pear?